Veteran cyber school teacher, Monica Frank, has an interesting perspective on cyber charter school. Not only has she been a cyber school teacher for the past 5 years. 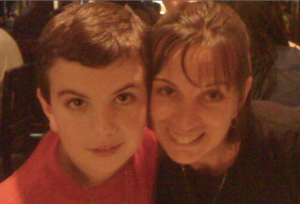 She also opted to enroll her son, Stephen, into a cyber charter school in 2012. Her experience and the path she’s taken with her son has not been easy. Read below for a touching account of what cyber school has meant to her and her family. I remember the moment my child was born. I held Stephen in my arms and told him that I was his mom. I talked to him about the amazing journey of life he was about to embark upon. I promised him, and myself, that I would be there every step of the way: encouraging him, protecting him, keeping him safe, and pushing him to reach for the stars. Along Stephen’s life journey, I have been challenged to keep that promise. Unfortunately, my decision-making has been especially difficult in cases when it comes to my son’s education. Because I am a teacher, I could not wait to help Stephen reach his potential in school. He loved elementary school and before long, he was ready to enter middle school. Stephen was nervous and excited for the transition and immediately asked me if he could play midget league football. My husband and I agreed, thinking the experience would help Stephen build connections and make friendships before entering school. I did not realize how this decision would dramatically change our lives. A month into the football season, Stephen was no longer as enthusiastic as he had been. He complained that the other boys picked on him. A few weeks later, he was threatened through a Facebook post. I found the post and took it to the coaches, who ignored the severity of the situation. His father and I instructed Stephen to delete all school friends from his Facebook account, hoping it would take care of the situation. My husband and I thought to use the situation as a learning experience, and simply move on. But the boys continued to pick on Stephen once school began. The taunting and teasing worsened, and slowly, my child began changing in front of my eyes. Once we recognized that this was a serious instance of bullying, we needed to do more. Being an educator in the state of Pennsylvania, I know about the laws pertaining to education. I knew that our home school district was responsible for providing a free and appropriate education for my child. When a child is being bullied day after day and no longer feels safe in his learning environment, that education is no longer appropriate. I contacted individuals at the school whom I thought could help. I reached out to the vice principal in our school. He told me that if Stephen did not react to the bullying, and ignored the other boys when he was picked on, it would make things easier on him. The guidance counselor seemingly grew tired of hearing Stephen’s complaints and threatened Stephen with detention with the other boys if he continued to discuss what was going on. As things became progressively worse, I asked that my son’s class schedule be changed. To my surprise, I was told this could not be done. So, things went unchanged for a while. With the passing of more time, Stephen stopped eating. When we took him to the doctor, he had lost 40 pounds. It was at that time that we learned he had an eating disorder. The doctor wrote a note to the school stating that he had been diagnosed with an eating disorder due to bullying. I also wrote a letter to the school, this time demanding that Stephen’s classes be changed. I became increasingly vigilant. Through many emails and phone calls, I re-stated the law and fought for my son. By the time the school agreed to change his classes, the damaged had already been done. By February of that year, my vibrant, funny child had no desire to do anything. I had let him down on the promises I made to protect him and keep him safe. I continued to try and work with the vice principal, but it was not getting us anywhere. Talk about someone socking you in the stomach. I found myself on high alert because my son had made the connection between his pain and the pain of others who had been bullied. Something had to be done. My husband and I needed to keep our son safe. We decided he would go to the 21st Century Cyber School in the fall. Fast-forward a year. Stephen now attends 21CCCS. He enjoys school again. He is able to complete schoolwork on a schedule that works best for him and really enjoys the interaction with his teachers and classmates. He has made distinguished honor roll each quarter because he is able to focus on his academics. Most importantly, I have my son back. He is so happy and full of life. His smile lights up a room. I took that smile for granted until nearly a year passed before I saw it again. When I look at him today, I am reminded of where he was a year ago. While he has emotional scars that still need to heal, I know he is in a much better place. This situation ultimately became a learning experience for my husband and me. I learned that there is hope even in the darkest moments. I learned that I have choices, even when the school district tells me I don’t. I learned that I need to be my child’s advocate and fight for what I feel is best for him. I learned the importance of knowing the law. Stephen attends 21CCCS without paying tuition. He is receiving an education that is safe, appropriate, and high quality. Sending our child to 21st Century has been one of the best decisions we could have made for our son. I’m glad we made it. What a sad, but beautiful story! Thanks so much for sharing this! SO brave to tell this. We, too, have chosen 21st Century Cyber Charter School and have never once regretted the decision. Thankfully, we did not have to do this because of bullying, but it is still the best thing for my son!